Peter Rinn, Breakthrough Solutions Group, recently published a list of weak nonprofit board practice. * Following are some of the items listed and my estimation of what can be done about them, based on my experiences as a nonprofit board director, board chair and consultant. Board position offers frequently may be accepted without the candidate doing sufficient due diligence. At the least, the candidate should have a personal meeting with the executive director and board chair. Issues that need to be clarified are meeting schedules, “give/get” policies and time expectations. In addition, the candidate, if seriously interested, should ask for copies of the board meeting minutes for one year, the latest financials, and the latest IRS form 990. Many bylaws have provisions dropping board members who do not meet meeting attendance criteria established by the bylaws. However, such actions are difficult to execute because of the interpersonal conflicts that can arise. For example, one organization with which I am familiar had a director who did not attend any meetings, but did make a financial contribution to the organization. When his resignation was requested, he refused. Not wanting to create conflict, the board simply kept him on the board roster until his term expired and then sent him a note acknowledging the end of his term. my impression is that this is rarely done. Board members should understand the potential personal liabilities that might be accrued as a result of violation of the federal Intermediate Sanctions Act (IRS Section 4958) and other statues. For example, under IRS 4958, a board member can have his or her personal taxes increased if involved in giving an excess benefit, such as selling property to the wife of a board member for less than the market rate. This often occurs when the board has given little thought to a succession plan, and the only person who seems qualified is currently in place. It also happens when the board has significant problems and nobody on the board wants to take the time to hold a time consuming position. Some boards make a bylaw exception by allowing a board chair, if scheduled for rotation, an extra year or two to be chairperson. To assess board interest in a nonprofit, foundations and other funders like to know every board member makes a financial contribution within their means or participates in the organization’s “give/get” program. This topic should be discussed at the outset of recruitment so it can be full understood by all directors. • Over selling the protection of D&O insurance and laws limiting the liability of directors. 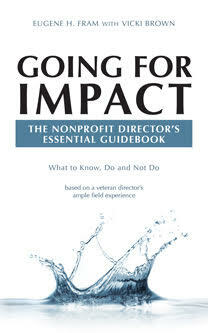 The importance of a nonprofit having a D&O policy, even a small one, can’t be over stated. I recently encountered a nonprofit that had operated for seventeen years without a D&O policy, although its annual budget was $500,000, and it was responsible for real estate valued at $24 million. Each director should be knowledgeable about the potential personal liabilities involved with the board position. • Allowing ignorance and poor practices to because it keeps leadership in control. Changing leadership and practice is difficult for both for-profit and nonprofit organizations. However, in the nonprofit environment it is more difficult because poor leadership and practices can continue for long time period, as long as current revenues meet expenditures. In some situations, this state of affairs continues because the board has low expectations of management and staff. This is a very good list. There is an excellent board resource book called Great Boards Plain and Simple – lots of practical guidance and advice for board members and senior managers. Here’s the link: http://www.silvercreekpress.ca/featured/great-boards-plain-and-simple-a-guidebook-for-non-profit-managers-and-board-members.html. If you sign up for the 10 Tips Newsletter for Board Members and Executive Directors you can also get a discount on your order.